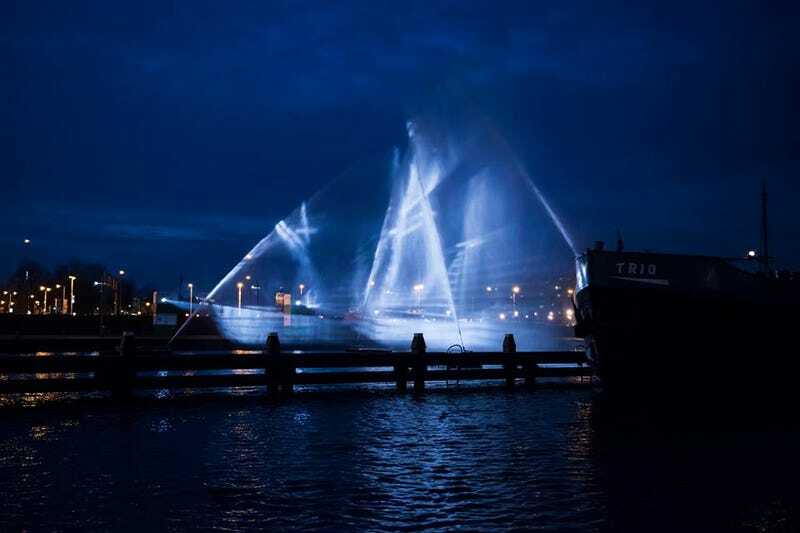 An eerie ghost ship appeared in Oosterdok thanks to the creative use of light and curtains of water. Above image by photographer Janus van den Eijnden. The Ghost Ship art installation was created by the VisualSKIN team for the Amsterdam Light Festival. The phantom ship is a hologram created by projecting various images onto curtains of water. The piece can be observed from almost every angle. Inspired by the real life 18th-century cargo ship of the Dutch East India Company. The ship (named The Amsterdam) was slated to sail from Texel to Batavia on January 8th, 1749. Due to a storm the journey ended in the English Channel on January 26th (1749) in the English Channel. Many years later in 1969 the wreck of The Amsterdam was discovered in the bay of Bulverhythe, UK. And you can still see it today, it actually has it's own Trip Advisor page!